Skin problems can be significant in patients with thyroid disease. Not surprisingly, the signs of an underactive thyroid are quite different from those of an overactive thyroid. 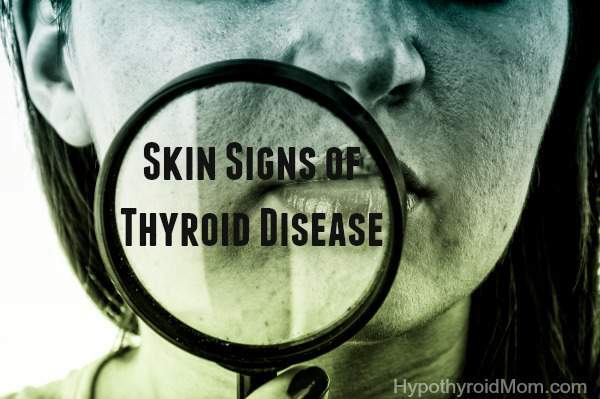 Whatever its cause— iodine deficiency, autoimmune disease, treatment of hyperthyroidism or medications—the skin signs of inadequate thyroid hormone are similar. The signs are rather non-specific, often subtle, and easily confused with other conditions or normality. In advanced hypothyroidism, the following symptoms may lead to a visit to the doctor and thyroid hormone testing. Skin swelling is myxoedema, due to the deposition of sugars called glucosaminoglycans. The thyroid autoimmune condition Hashimoto’s thyroiditis is associated with other autoimmune diseases, including vitiligo (white patches of skin) and alopecia areata (hair loss in which there are round bald patches). With thyroid hormone replacement, the symptoms and signs of hypothyroidism gradually return to normal. Some patients may continue to have mildly dry skin even when blood tests indicate their thyroid hormone levels are optimal. Thyroid hormone replacement should be undertaken gradually to avoid complications of treatment such as excessive flushing, sweating, and paradoxically, further hair loss. Hypersensitivity reactions are rare, but can include rash. Graves’ disease is an autoaimmune disease often recognized by protruding eyes. About 2% of patients with Graves’ disease develop pretibial myxoedema. This often arises at sites of previous injury. It occurs more often in females than in males, and more often in patients over the age of 50 years than in younger people. Pretibial myxoedema can be itchy or painful and can persist after successful return of thyroid hormone status to normal levels. 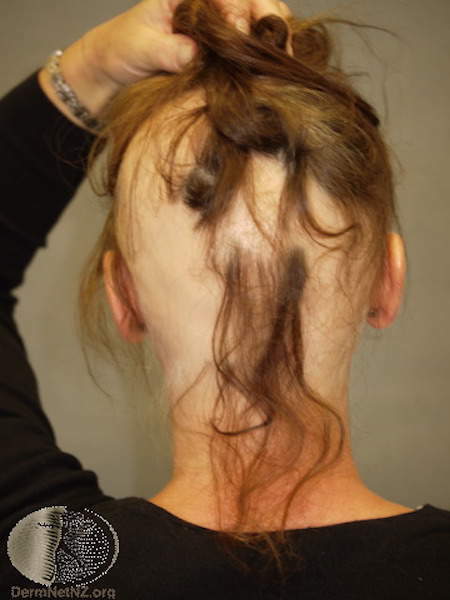 As with Hashimoto’s thyroiditis, Graves’ disease is associated with other autoimmune diseases, including vitiligo (white patches of skin) and alopecia areata (hair loss in which there are round bald patches). Treatment of hyperthyroidism is often with carbimazole or propylthiouracil. These occasionally cause an itchy rash, which is usually mild. 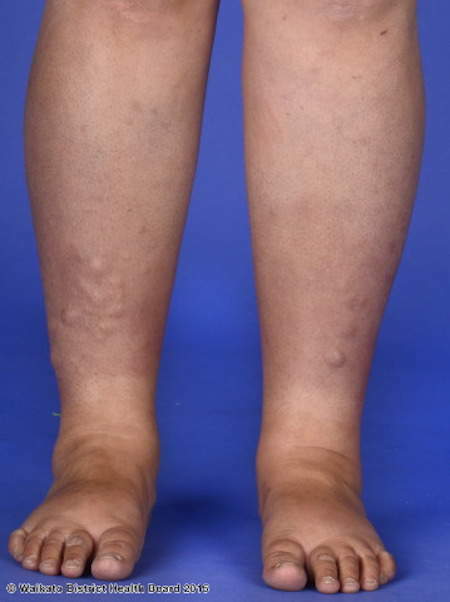 Rarely, hypersensitivity vasculitis arises, which can present with purple non-blanching bumps (palpable purpura) on the lower legs and feet. Palpable purpura should be urgently investigated and the drug should be stopped. Associate Professor Dr. Amanda Oakley is a dermatologist at Waikato Hospital in Hamilton, New Zealand. She is also the website manager and chief editor of DermNet NZ. DermNet NZ presents authoritative facts about the skin for consumers and health professionals in New Zealand and throughout the world. It is written and reviewed by dermatologists, other health professionals and medical writers. Have you heard of anyone with Hashimotos dealing with anetoderma? 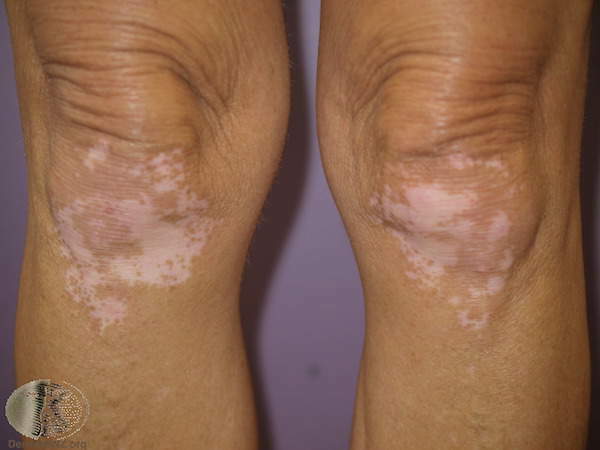 They are white patches that look saggy on the skin and are associated with autoimmune conditions, usually lupus. Hi I read your article, if you are being treated for hypothyroidism, have the doctor check you out, make sure you get put on a hormone to balance out your body and take your medication on time. Levothyroxine is what I take and has been pretty successful along with a good diet and exercise. My thyroid swollen pretty large. Make sure you see a good endocrinologist to x ray your throat. If you have any questions email me, I’ll be glad to share. I was diagnosed with Hashimoto’s 4 years ago. I have never experience any hair loss but do suffer from very painful red skin rashes on my fingers. What causes this?? Just had my blood work done and my TSH is finally in the normal range, but I’m still experiencing symptoms. Especially the dry, red, flaky skin on my face. I wish I knew how to control this? Not sure whether this will help but it has helped me a lot. There is a cream developed in California for people who have had facelifts and other work done on their faces. It is called Sheald by IS Clinical. I had heart surgery 3 years ago and I bought it to help with the scarring on my chest and leg – it is very good. I am hypothyroid and 2 years ago the skin on my face was very dry, red and flaky as you mention so I decided to give the remains of my tube of Sheald a trial on my face. It is quite thick and takes a time to sink in but it has worked. The dry flaky skin has disappeared and the redness has almost disappeared. I use it about three times a week if I am not going out anywhere as it sinks in quite slowly. It is very expensive in the UK but I gather from a friend in the US that it is cheaper there. Another thing for anyone who has split and ridged nails is CND RescueRX which I bought on Amazon. I have only been using it for two weeks and the difference is remarkable. I was diagnosed July 2004 with Hashimotos bc I had a newborn (in april) and a toddler and was always so exhausted I couldn’t take care of my kids…in addition to gaining 3-4 pant sizes in 2-3 weeks….I have found that Synthroid is the only med that keeps my levels somewhere near normal and have been on every dose from 88-175. I have experienced pretty much every symptom over the years and within the last few months, am now having swelling and itching over my whole body…I’m miserable 🙁 my last bloodwork also showed liver enzymes roughly 3 times normal and thyroid was way way low…so now im waiting to get bloodwork done again to see if both are normal now. With all of this being said, I can deal with the aches/cold intolerance/weight fluctuations/etc , but this whole body itching (literally head to toe…hands, arms,head,chest,back) is just driving me nuts….lotion helps some (short term). Does anyone have any suggestions? I just turned 37 and swear im gonna go insane with this itching. 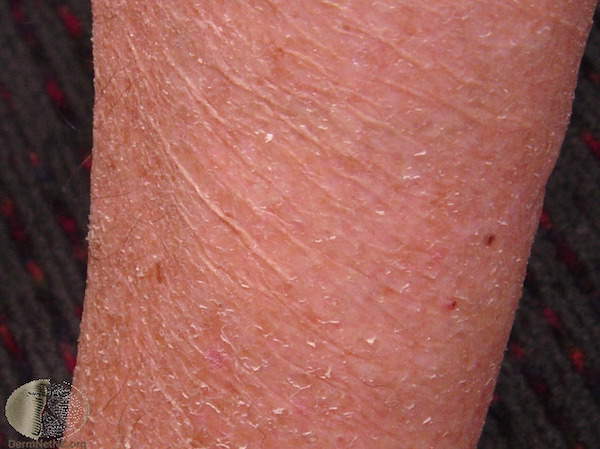 Elevated liver levels can cause very itchy skin. Wow! This has been the best site for me. I’ve struggled with skin problems since 1990. I am humbled and will contact my doctor to put me back on it. The Levothyroxine was too strong. I was going thru Chemo and radiation treatment too. It’s been close to 2 years without Levothyroxine. 4 years cancer free 😇so glad I found you. God bless you all! Hello Dorleen, 4 years cancer free! So wonderful but I can only imagine what a toll this has all taken on you emotionally and physically. Good to have you at Hypothyroid Mom. I had thyroid out 30yrs ago and have been on thyroid medicine since. Now apparently part of thyroid has grown back and with it 7 nodules. For the last 10 months have been dealing with chronic skin rash over the whole body. I was on steroids for 9 months but still rash continued. Then my face swelled and b ot rashy. I’m going nuts because I itch all over…nothing relieves it. Now I’m on methotrexate. ..which is a lose dose chemo pill…I take once a week for last 5 weeks and I’m still breaking out with rash and itching all over. HELP…any suggestions? I am 66 yrs old and this is miserable. The Dr said it is an autoimmune problem and methotrexate will suppress immune system but so far it hasn’t helped..it just makes me sick for a few days and I’m still itching and getting the rash. Any suggestions will help. Methotrexate is serious stuff. I wouldn’t take it. Try grandpas pine tar soap let the lather sit on the rash for a few mins. Hope this helps. What about rash on face not in scalp?? Ketaconazol shampoo helped my daughter. It is available otc and you can also get a script for it. It’s a little pricey but insurance usually will pay for it. I take Hydroxine for rash and severe itching. It only helps the symptoms to give me relief. I’m currently eating the Autoimmune protocol diet. For the most part the rash and itching are much better unless I cheat with AIP diet. I have felt so much better after I found how to eat right.